The year is coming to an end and a new year is right upon us. For me, there is an excitement in the air that a fresh new season is almost here. This time of year, our family sits down at the table for a time of reflection of all the blessings of the year and we all talk about ways we can do life better as a Christian son and daughter. We talk about specific ways we can commit to do better in the following areas: spiritual, family, academics, health, and friends. 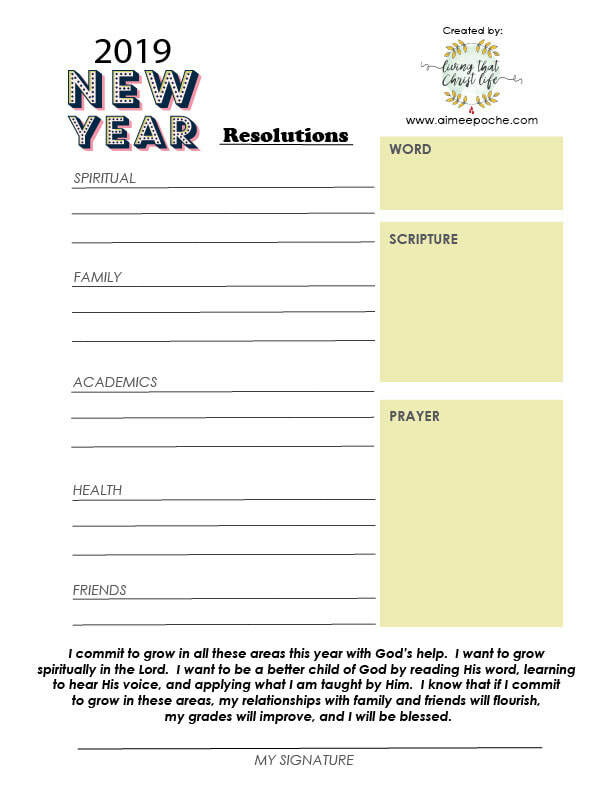 We each take time to pray for a Word from the Lord and then write our word down on each of our own resolution papers. I encourage the children to look their word up in the bible concordance and read all the different bible scriptures related to their word and decide which one pops out to them. That becomes their scripture for the year and they write it in the scripture space on the resolution paper. They then look at each specific areas to improve and write down specifically what they need to improve or would like to do in that area. They sum it up in a prayer and write that down in the space provided on their resolution paper. When we are done, my husband and I will spend time with each child and talk about their goals for the New Year. We then let them read the prayer at the bottom of their resolution paper and sign their name. The last thing we do is find a spot in their room or bathroom mirror where we tape it up for them to see it throughout the New Year. We are believing for a great New Year 2019! Our prayer is that you and your family will experience the Lord on a deeper level and have your best year yet. HAPPY NEW YEAR!